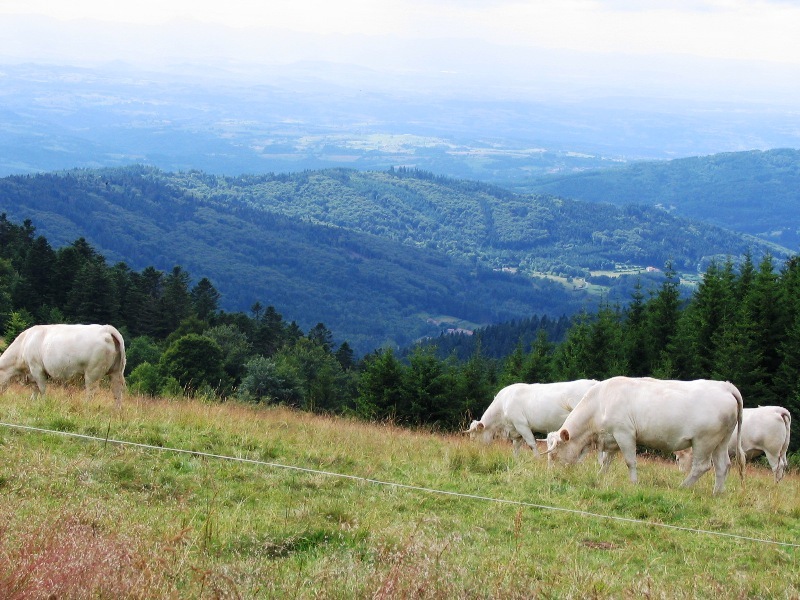 The Auvergne is magnificent with its oak forests, volcanoes, rocky peaks which stand out as monuments and small villages where the inhabitants take the time to live. The beauty of this region is exemplified by blues and greens representing a rainbow of colour. This is an area of valleys, vast forests, crystal clear lakes and sinuous rivers. It is an environment which invites walking and water sports. When following the marked trails, walkers take the small forest paths where they can rest on the grass beside the water. 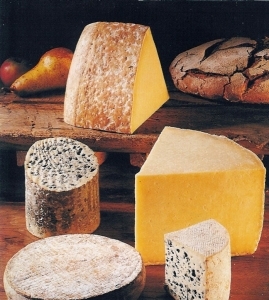 Hautes Chaumes is also the centre of very old crafts including, for example, the celebrated blue cheese “Fourme of Ambert”. This was already being made during the time of Julius Ceasar’s legions who ventured into the mountains of the Haut Forez. The Haute Chaumes covers a very large area, some 10,000 hectares, of heather and high pastures. On a clear day there is a beautiful view of the Alps to the east and of the smaller mountains of the Puy to the west. An exceptional flora is to be found in the hollows which in winter are covered in snow. At the same time the fauna is capable of resisting the icy cold, snow and wind which is most remarkable. 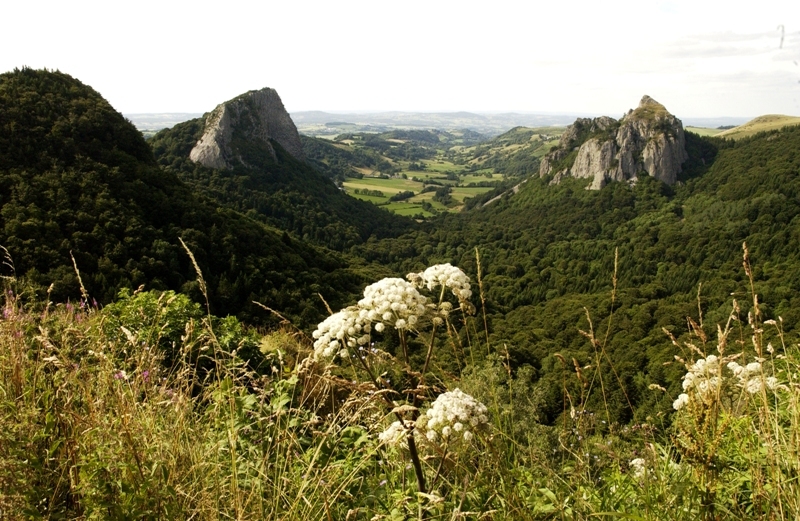 More than a quarter of the Auvergne consists of natural parks, but apart from some specialists few people know where the Livradois forest is situated. It stretches east from Clermont-Ferrand and between the towns of Thiers to the north and Puy-en-Velay to the south. The peaceful oak forests, undulating meadows and winding rivers makes for a relaxing atmosphere. One comes to the Auvergne for the scenery and the choice between different parks. The scenic park of Livradois Forest is to the east with forests and valleys in which you would wish to lose yourself. Here we find local crafts including paper making using old water mills. The bare undulating plateau of the Hautes Chaumes is a part of the Livradois Forest where we find the small town of Ambert (population 7,500) which, in the past, was renowned for its paper mills. If you are looking for culture you will be fulfilled by the Auvergne. The region has an abundance of Roman churches and monasteries and is a real treasure of Roman art. There are more than 250 buildings dating from the 11th and 12th centuries. The Roman heritage of the Auvergne is one of the most imposing in Europe. 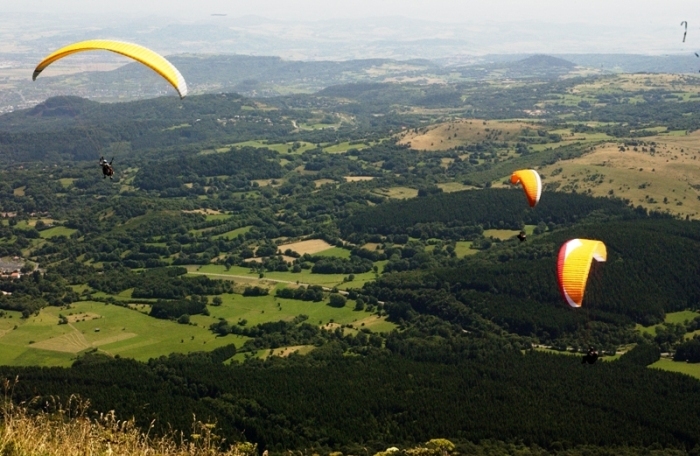 A very popular town which remains authentic is the Puy-en-Velay, the departure point for routes to Saint Jacques de Compostelle (GR 65), UNESCO World Heritage: The Via Podiensis. The cathedral at Puy-en-Velay, the travellers hotel in the town and the French pilgrimage route are listed in the World Heritage site by UNESCO. The remainder of the town equally merits a visit – the narrow streets, the soft colours of the roofs and the temperament of its inhabitants – everything here smells of the south and you could imagine you are in Italy. Le Puy-en-Velay is often called by the name ‘St Michel Mountain of the Auvergne’. It is built on and around balsalt rocks of volcanic origins. It is without doubt one of the most interesting towns in France. One of the rocks has the name “Dyke d’Aiguille”. A Roman chapel, consecrated to Saint Michel, was built at the summit. In one of his novels George Sand describes the town as follows: It isn’t Switzerland, it’s worse; it’s not Italy, it’s more beautiful, it is the centre of France with its Vesuvius extinct (see www.puy-en-velay.com). The Chaise Dieu is the most impressive abbey in the Auvergne. In the church itself there are eleven magnificent tapestries from the Flemish renaissance, weaved in Brussels between 1500 and 1518. They represent medieval scenes from the bible of the poor. On the chancel wall is the much celebrated “Dance Macabre” beautifully conserved. Summer is the season of festivals. In July, Gannat celebrates its world cultures (see www.gannat.com). Hundreds of artists from the four corners of the world gather to spread their gastronomical and cultural traditions. At the Chaise Dieu, during the middle of August, internationally reputed artists gather for a series of renowned classical and church music concerts (see www.chaise-dieu.com). Also in August, during the theatre festivals, Aurillac is full of acrobats, storytellers and fantastic animals. In September the Augvergne continues to celebrate. At Puy-en-Velay an ancient competition, going back to the middle ages, is reinacted. Here, an artificial bird made of hay is placed on top of a long pole and archers compete for the coveted title “Roi Oiseau”. Nobles, knights and jesters relive ancient times with parades on horse and foot and ancient crafts are revived. Meals are served to celebrate the renaissance, either outside or in taverns. Local inhabitants thoroughly research the customs, food and clothes worn during the 16th century. It is almost magical the way these times are relived (see www.le.puy-en-velay.com). The convent at Laveaudieu, roughly 20 kms from the Chaise Dieu, was founded by Robert de Turlande, who was also founder of the Chaise Dieu. During the French revolution, an attempt was made to demolish the church cloister. A revolutionary managed to destroy the church tower but in so doing fell to his death. After that other vandals were so sobered that they decided to leave the convent alone. Later on, Laveaudieu was again saved from destruction at the last minute. 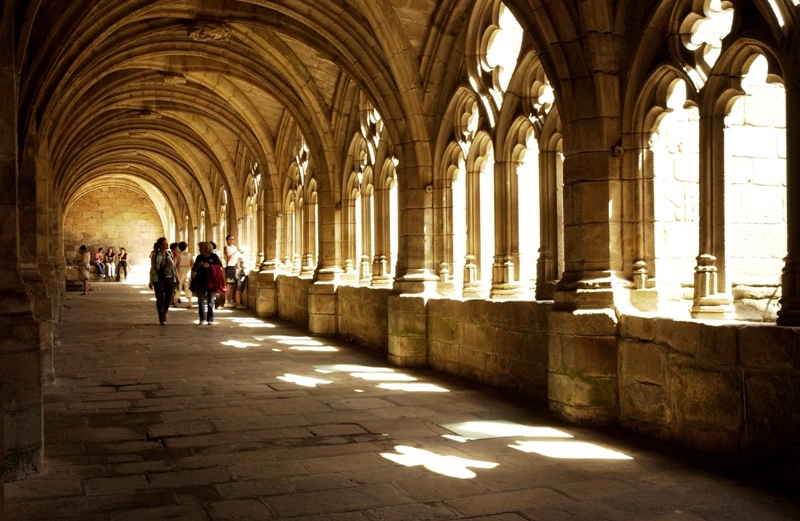 After the second world war the cloister was sold to the Americans who wanted to dismantle it and reconstruct it at Closter, a museum of cloisters. The stones had already been numbered when a document appeared, dating from 1796, referring to paintings on the dining hall walls. For more than 250 years, the walls had been replastered and the dining hall used as a stable. In 1951 specialists removed the plaster and rediscovered the mural paintings. One remains in awe before this Byzantine art from the 12th century, representing, amongst others, Christ surrounded by symbols of the four avangelists. Thanks to the plaster the paintings had been preserved in all their splendour. It truly was the moment for the French authorities to appreciate its cultural value.